Are you redesigning your garden? Are you replacing your lawn? For high quality turf laying in Winchester, look no further than Abbey Turf. We are the lawn specialists, known for supplying and laying weed-free turf for private and commercial clients in the area. You will not be disappointed with your newly transformed garden when you choose our Winchester turf laying team. A healthy and vibrant lawn is what every homeowner wants in their garden. To help you achieve this, we offer an excellent Winchester turf laying service which has been recommended by many homeowners and business owners in the area. Not only can we supply you with the finest turf, but we will lay every square metre with utmost precision, leaving you with a fresh and flawless lawn. The secret to an impressive lawn is well-sourced grass that has been properly nourished and put down by a team who specialise in turf laying in Winchester. Our turf is not grown on netting, and we make sure that it is regularly inspected to ensure every square metre is lush, healthy and completely free of weeds. Our turf laying Winchester company aims to deliver your turf within 24 hours of your order, to ensure you receive the best quality product. At Abbey Turf, we pride ourselves on being the best turf laying Winchester company, which is why we offer a range of different lawn types. With our comprehensive knowledge of lawn and garden health, we will always recommend the best turf for your garden. This may depend on the acidity and texture of your soil, but no matter what type of ground you have, we will have a suitable turf option for you. Once you have purchased your turf, you will no doubt require a Winchester turf laying professional to come and put it down. At Abbey Turf, we have earned a superb reputation for turf laying in Winchester due to our professionalism and attention to detail. Before we lay the turf, we will make sure that the ground is correctly prepared so the grass will grow evenly and healthily. 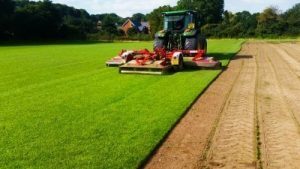 At Abbey Turf, we are a family-run business that has provided a professional turf laying Winchester service for over 20 years. We have a site spanning 180 acres that is dedicated to growing high-quality turf for our customers. Whether you are covering a domestic garden, golf course, or commercial ground, we are the number one choice for turf laying in Winchester. Are you wondering what makes us the best company for turf laying Winchester has to offer? The evidence is clear in the quality of our products and the standard of lawns we lay. Over the years, we have accumulated a large base of loyal clients who come back to us for all of their lawn and landscaping needs. Abbey Turf supplies rolls of turf by the square metre, so you can buy exactly the right amount no matter how big or small an area you need to cover. There is nothing more frustrating than not knowing when an important delivery is going to arrive, but this is not an issue with our turf laying Winchester company. We give customers an exact delivery time and date so as to cause minimal disruption to your day. Our Winchester turf laying service is prompt and efficient, so your brand new garden will be ready to use in a matter of hours. For the best turf laying in Winchester, call Abbey turf on 02380 812302 or send an email to info@abbeyturf.co.uk.